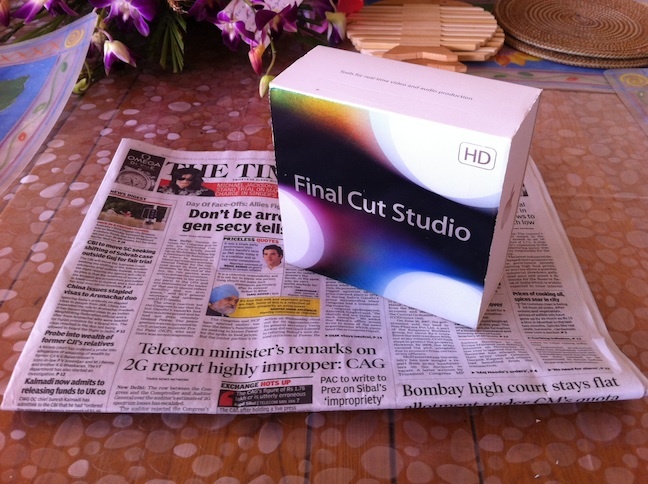 This is what a legal copy of Final Cut Studio 3 or FCP 7 looks like. Have one? Of late I've been shown many instances of FCP projects that don't link back to digital files, dropped frames even with fast disks, media files present but showing as offline, and the dreaded 'General Error'. In extreme cases, projects get corrupt too. This seems to be happening a bit more often in recent times than previously. And, most important of all, I have not been able to duplicate or recreate these issues any any of my systems. At home, or systems I've installed by myself at friend's edit suites. So what's going on? Is FCP 7 to blame? I think not. One observation that I made with every reported case is that these issues happen in systems that do not have a valid FCP license. Meaning their FCP is cracked, not paid for, completely illegal. Some FCP users are not even aware that FCP had to be paid for. I found this out when I asked to see the box containing the original software disks. Why, even a large post house on Mumbai's upmarket Linking Road had many FCP systems without a license. Come to think of it, even TV show producers and possibly TV channels use FCP without licenses. In another post house at Bandra I studied 5 systems and tried to recreate one particular issue with FCP 7. I could not. The systems functioned flawlessly. Users there often could not even remember the last time their systems last crashed or hung. Reason? All 5 systems had licenses which were not only valid, but registered over the 'net with Apple. If you have paid for and purchased Final Cut Studio ver. 3. And you have registered your license on the Internet with Apple. You have nothing to fear. Your system will work without a hitch. And not exhibit any of these issues. If, however, you have 'borrowed' FCP, and not registered it, or have otherwise cracked it, then beware. Apart from being illegal, this is a defective method of operating FCP. And it will catch up with you somewhere, sometime. But it still doesn't add up. So what if its 'cracked FCP', it still has to work right? Well, not quite. I think some person somewhere made a copy of the original FCP disks on to a hard drive. This copy, somehow got corrupted while being copied from disk to disk. And these corrupted copies are with some persons somewhere in Mumbai. And these defective FCPs are doing the rounds. Being used to install FCP over and over again. If you are an FCP system user and don't have a box with the original software and DVDs, please go out an buy one. It costs under Rs 50,000 and is worth every Rupee. Many many individual editors and small production houses in India have bought one. In fact I dare say, more people in India have actually bought FCP than have not. Be one of the good guys. And no matter what your dealer, reseller or friends tell you, there is no FCP demo, no FCP evaluation, no 30-day trial. You pay money, you get a copy, you use it. That's how it works. Even if the system that's being used to edit your films is borrowed, or hired, ask to see the license. And have it registered over the internet in your presence. And you will see for yourself, whatever FCP problems you had will simply go away. Installing software without a license, is software piracy. Pirating software and pirated software are completely illegal. Sometimes pirated software is defective as well.